A plane lies on the side of the 101 freeway after making an emergency landing. 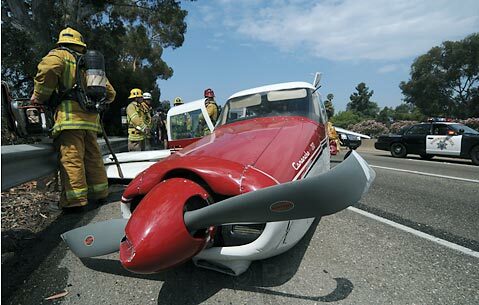 No one was seriously injured when a pilot was forced to land a small plane on Highway 101 in Goleta Sunday morning. The plane, however, was struck by two vehicles traveling southbound on Highway 101 at the time. One of three passengers had a minor injury was being treated at Santa Barbara Cottage Hospital, according to a spokesperson from Santa Barbara County Fire, which responded to the incident. Neither of the two people on board the aircraft were injured, though the plane was severely damaged. Witnesses reported hearing the plane’s engine sputtering, and the plane itself wavering unsteadily as it flew lowly over Goleta just after 10:30 a.m. According to Internet flight tracking websites, the plane was on its way to Santa Barbara Airport from French Valley Airport, a small airport in southwest Riverside County near Temecula. The pilot radioed to air traffic controllers that he had no fuel remaining and had lost engine power, according to Federal Aviation Administration spokesperson Ian Gregor. The pilot told air traffic controllers he intended to land on the highway, and did so a few hundred yards west of Turnpike Road. The landing spot was about a mile from Santa Barbara Airport, and was scheduled to land at 10:45 a.m., nine minutes after its emergency landing. According to FAA records, the fixed-wing, single engine plane is owned by Kris Michel of Eureka, Calif.
Traffic was down to one lane and moving very slowly in the southbound direction, but is now flowing freely. It took about an hour to remove the plane from the freeway.